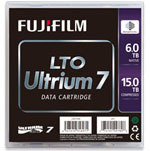 The new Quantum LTO generation 7 (MR-L7MQN-01) specifications more than double the tape cartridge capacity from the previous generation, 6TB native including capacities of up to 15TB per cartridge when compressed. 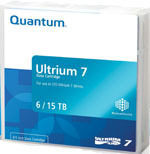 Large files will also transfer more quickly with the Quantum MR-L7MQN-01 LTO-7 Data Backup Tape Cartridge offering 300 Mbps native data transfer speed and data transfer rates that are up to 750MB per second compressed, which can translate to more than 2.7 terabytes of data an hour per drive. The cartridge is desgined to maintain it's archival quality for up to 30 years. 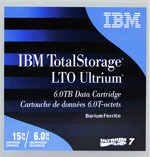 LTO-7 will continue to include features that were introduced in previous generations, including a partitioning functionality that allows users to present a tape-based file system with the use of LTFS. LTO generation 7 provides continued support for hardware-based encryption and WORM (Write-Once, Read-Many) functionality. 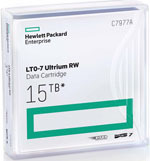 This helps ensure a balance of performance, capacity, compatibility and cost control supporting a broad range of security-rich and portable data storage options for backup and archive that are easy to use and address a vast majority of storage needs.